Russ Crandall is the blogger behind paleo-centric site The Domestic Man and a former Yahoo Food Blogger of the Week. Below, he transforms leftover holiday ham into something worthy of the spotlight itself. The day after a big feast can be liberating, with piles of pre-made food filling your fridge. No cooking required! However, it always turns into a different story a few days later, when I find myself asking: “How am I going to eat three pounds of leftover ham without going crazy?” Here’s an easy, delicious way to clear out some leftover holiday ham in style. 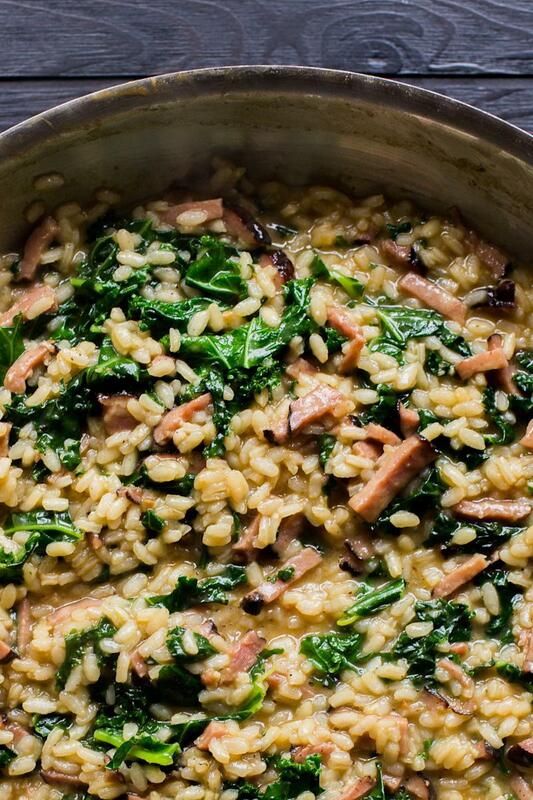 Risotto has been around since the 1500s, and today is one of the most popular ways to prepare rice in Italy. The rice varieties used in risotto (typically Carnaroli, Arborio, or Vialone Nano) are high in starch and impart a creamy texture to the dish. There’s a certain technique to it: First, create a soffrito using butter and shallots or onion. Then, in the same pot, toast the rice and coat the grains in melted butter. Afterward, pour in wine and let it evaporate, ladle in warm broth until the rice is cooked through, then finish the dish with butter and/or cheese. 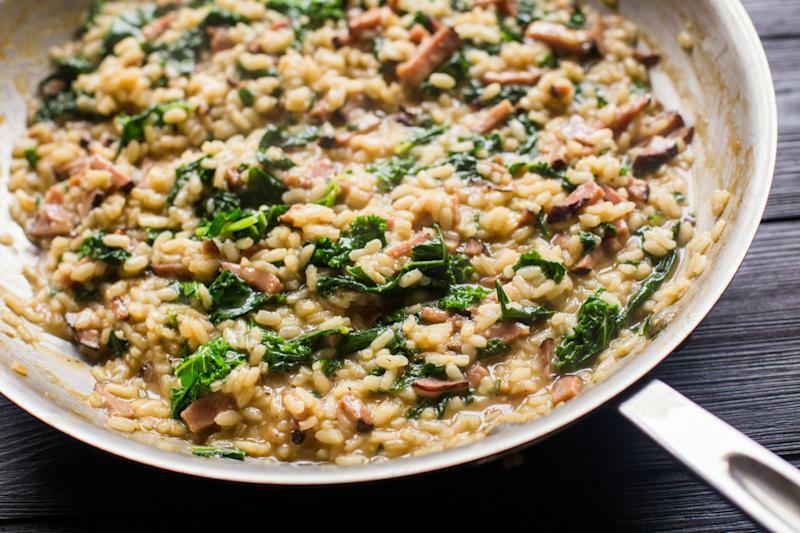 The risotto-cooking process requires almost constant stirring in order to loosen up the starch and to keep the rice from sticking to the pan, so expect to spend a lot of time in front of your stove. (I usually grab a book or watch a streaming movie on my phone.) As an added bonus, your arm will get a bit of a workout! Add the broth to a stockpot, then bring to a simmer. Reduce heat to low to keep warm while you prepare the risotto. In a large skillet, warm 2 tablespoons of butter over medium heat. Add the shallot and cook until softened, about 3 minutes, then add the garlic and sauté until aromatic, about 30 seconds. Add the ham and sauté until browned, about 5 minutes, stirring often with a wooden spoon. Stir in the rice and sauté until opaque and slightly browned, stirring constantly, about 5 minutes. Some of the ingredients will start to stick to the bottom of the pan, which is fine. Stir in the wine and simmer until almost evaporated, stirring constantly, about 3 minutes. Stir in 1 cup of the broth and simmer until almost evaporated, stirring almost constantly, about 5 minutes. Continue this process until nearly all of the broth has evaporated and the rice is soft, 15 to 20 more minutes. If the broth has evaporated and the rice is still too firm for your liking, add a bit more broth (if you have some) or a bit of water. Remember to keep stirring constantly — this evenly distributes the heat and keeps the rice from sticking to the bottom of the pan. Once the liquid has mostly evaporated and the rice is soft, stir in the remaining 2 tablespoons of butter and the kale, stirring until the butter has melted and the kale has softened and turned bright green, about 4 minutes. Add the cheese and stir until melted; stir in the hot sauce, taste, and add salt and pepper to taste. Let rest for a few minutes before serving. Notes: If you are avoiding dairy, use olive oil instead of butter, and omit the cheese at the end. 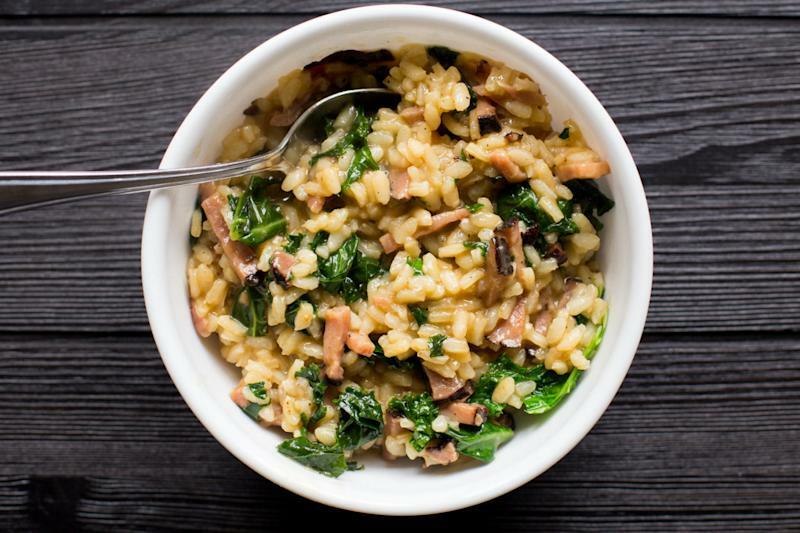 The natural creaminess of the risotto rice will more than make up for any lack of dairy. If you’re not up for hot sauce, a squeeze of lemon juice will work just as well as the spicy stuff in terms of acidity and balancing flavors. Also, feel free to add in more ingredients depending on what you have on hand. You could even add more ham — after all, you’re trying to get rid of those pesky leftovers, right?